Welcome to the Community Land Model. The Community Land Model is the land model for the Community Earth System Model (CESM). It is a collaborative project between scientists in the Terrestrial Sciences Section (TSS) and the Climate and Global Dynamics Division (CGD) at the National Center for Atmospheric Research (NCAR) and the CESM Land Model and Biogeochemistry Working Groups. Other principal working groups that contribute to the CLM are the Chemistry-Climate, Paleoclimate, Climate Change, and Land Ice Working Groups. 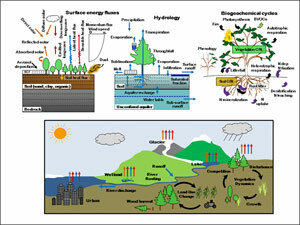 The model formalizes and quantifies concepts of ecological climatology. Ecological climatology is an interdisciplinary framework to understand how natural and human changes in vegetation affect climate. 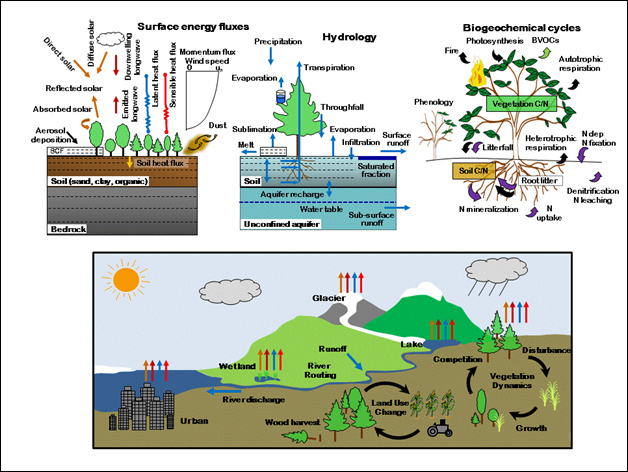 It examines the physical, chemical, and biological processes by which terrestrial ecosystems affect and are affected by climate across a variety of spatial and temporal scales. The central theme is that terrestrial ecosystems, through their cycling of energy, water, chemical elements, and trace gases, are important determinants of climate. The land surface is a critical interface through which climate change impacts humans and ecosystems and through which humans and ecosystems can effect global environmental change (iLEAPS Newsletter article on CLM). The current version of the Community Land Model is CLM5. Lawrence, D.M., et al., 2018. The Community Land Model version 5: Description of new features, benchmarking, and impact of forcing uncertainty. in prep for J. Adv. Model. Earth Sys.. The Community Earth System Model (CESM) is a fully-coupled, global climate model that provides state-of-the-art computer simulations of the Earth's past, present, and future climate states.